ROYAL CANIN Maxi Puppy In Gravy Wet Dog Food is both scrummy and nutritious! 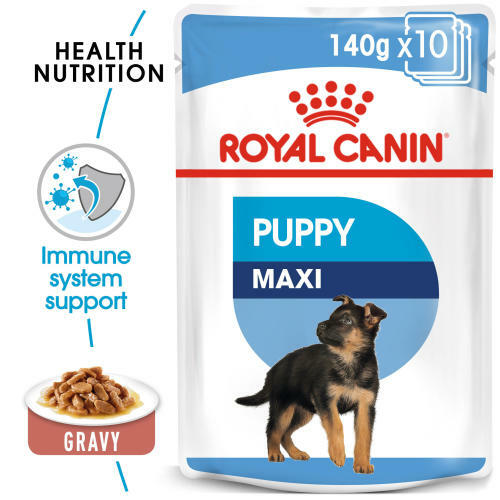 Suitable for puppies up to 15 months old that will have an adult weight between 26-44 kg, ROYAL CANIN Maxi Puppy in Gravy is specially formulated with all the nutritional needs of your large puppy in mind. To support your puppy’s natural defences during this key growth period, ROYAL CANIN Maxi Puppy in Gravy contains an exclusive complex of antioxidants – including vitamin E – that helps to support your puppy’s immune system while it’s still developing. The highly digestible protein and prebiotics in ROYAL CANIN Maxi Puppy in Gravy help to support good digestive activity and a healthy balance of intestinal flora. ROYAL CANIN Maxi Puppy in Gravy contains a moderate energy content to meet the moderate energy needs of large breed puppies like yours. To cater to each dog’s individual preferences, ROYAL CANIN Maxi Puppy is also available as dry food, with crunchy and tasty kibble. If you’re considering mixed feeding, simply follow our feeding guidelines to ensure your dog gets an accurate amount of both wet and dry food for optimal benefit. IMMUNE SYSTEM SUPPORT - Complete wet food for dogs - for large breed puppies (adult weight from 26-44kg) up to 15 months old|Helps support your puppy’s natural defences thanks particularly to a complex of antioxidants including vitamin E.
DIGESTIVE HEALTH - Supports digestive health and balance of intestinal flora. LONG GROWTH - MODERATE ENERGY - Meets the moderate energy needs of large breed puppies. Meat and animal derivatives, oils and fats, cereals, vegetable protein extracts, derivatives of vergetable origin, minerals, yeasts, various sugars Crude ash: 2.2%. Crude fibre: 1.4%. Crude oil fats: 5%. Moisture: 79.5%. Protein: 8.3%.